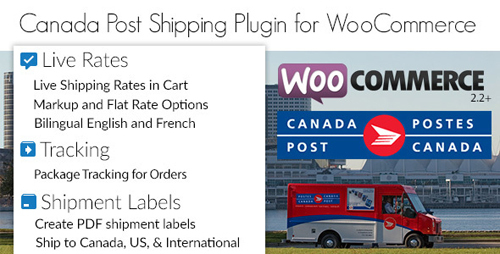 This Canada Post Shipping Plugin for WooCommerce provides integration with�Canada Post�and your WooCommerce website. It is able to provide live shipping rates directly to your customers in their shopping cart and at checkout. Also, it provides up-to-date package information from Canada Post�s Parcel Tracking service. This plugin is fully bilingual in English and Francais (French) and is compatible with WPML, a multilingual plugin for Wordpress. Canada Post PDF Shipment Labels can be created on Woocommerce orders. It can be used to ship with in Canada as well as Worldwide.